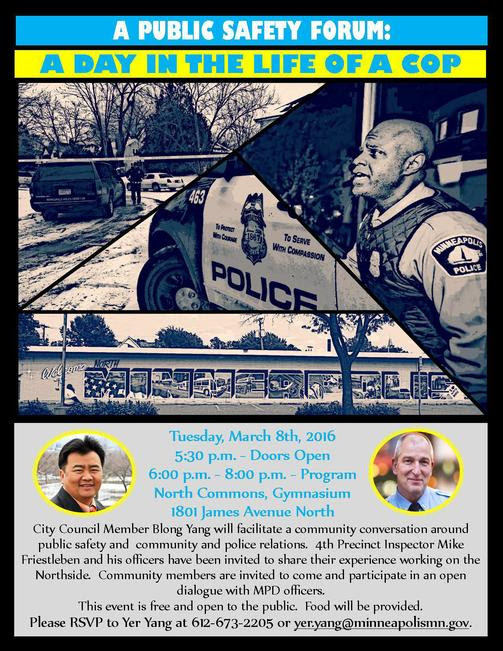 City Council Member Blong Yang will facilitate a community conversation around public safety and community and police relations. 4th Precinct Inspector Mike Friestleben and his officers have been invited to share their experience working on the Northside. Community members are invited to come and participate in an open dialogue with MPD officers. This event is free and open to the public. Please RSVP by March 7th to Yer Yang at 612-673-2205or yer.yang@minneapolismn.gov.